David is the co-founder and CEO of DIDiT, Inc. DIDiT is a consumer facing mobile application (DIDiT NY on iOS) and website (DIDITNY and DIDiTLA) that provides a holistic experience of discovery, indexing, collaboration, and commerce of noteworthy experiences. Prior to DIDIT, David was the SVP of Advertising Sales and Partnerships at TouchTunes Interactive Networks (acquired by Searchlight Capital Partners) where he was responsible for transitioning an out-of-home network into a mobile and tablet based advertising platform. 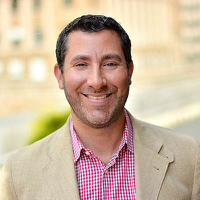 Prior to TouchTunes, David held senior leadership positions managing both large and small teams across media sales and business development at VEVO (the largest destination for music video content), Big Lead Sports (acquired by Gannett), Yahoo!, Univision, and CBS Interactive. David started his career at IBM where he was responsible for managing the digital transformation of the PGA TOUR, NBA, NHL, and the PGA of America. David is a committee member of the Entertainment, Media, and Communications division of the UJA and is on the advisory boards of NYVC Sports and SilverLine Athletics. He lives in Chappaqua, NY with his wife and two children and is an avid skier, tennis player, and music lover.